The following are three of tactics that can be used to get the ball inside. Whether they are a part of a play your team runs, or they are part of the concepts you teach players, all teams must have several strategies to get the ball inside. This tactic is extremely effective when the post defender bumps curl cuts by offensive players. The ball starts at the high elbow above the post. 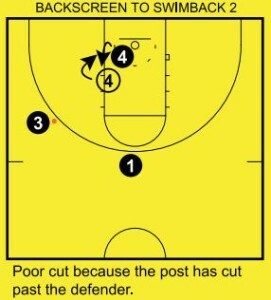 The cutter cuts across the lane below the post and then curls very tight around the post to the middle of the lane. 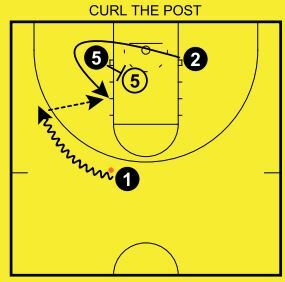 As the cutter comes across the lane the post defender must momentarily help on the curl, if the post does not help, the pass should go to the cutter. As the defender is helping on the curl the passer brings the ball towards the wing to improve his/her angle and the post steps into the post defender to establish position. Once the cutter’s defender clears the passing lane is usually open. In many cases the cutter may set an incidental screen. by running into the post defender as he/she completes their cut. If the cutter’s defender attempts to go over top of the screen then the post should step higher and the cutter should fade to the corner. 2) serve as a pressure release. 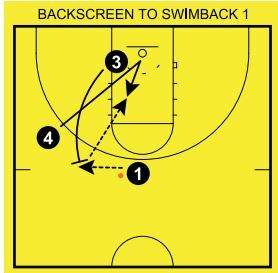 A small to big back screen is a very effective way to relieve denial pressure because, unless the defense switches, the small defender will have to help momentarily as the offensive post player comes off the screen to the basket. If the small defender does not help they may give up a lay-up. The screener (the small) steps out of the post and sets a back screen for the post to go to the basket. The screener then quickly steps out to the 3 pt. line and receives a pass from the top. 3) He must not cut past the defender and allow the defender to easily get over top and front or side front. To execute a good post up the post must swim back by taking their baseline arm aggressively over top and in front of the post defender and, with their baseline foot, step across the top foot of the defender. The passer may be able to pass directly in to the post or may need to take a dribble to the baseline to improve the passing angle. This tactic has the same principle of curling the post: the post defender must defend a cut by another offensive player. The cutter will flex cut low off the post and force the post to help momentarily. As the post defender helps the offensive player ducks in right in front of the post defender. As in all flex action the ball wil be at the opposite high elbow. The post should not step outside the lane to set a screen for the cutter because it makes the distance too far to get back in and post up. The flex screen should be set with the posfs back to the basket. Then to execute the duck-in properly the post wil drop step towards the bal with hislher top foot and then slide quickly in front of the defender. The ball may be passed into the post high or low depending on the post defenders recovery. 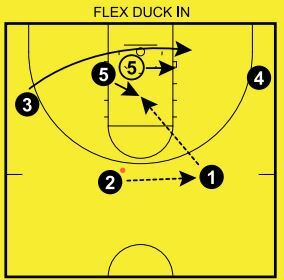 Similar to the regular duck-in, the post should go back in the direction he/she came from to score, because there should not be any back-side defenders to help. This is done by completing a drop step with the foot furthest from the passer. The finish can be either a lay-up or a power move. These tactics are team concepts because they will involve more than one player. When concepts are taught to players they must learn to read the defenders because the position of the defenders will determine where the ball should be passed. In the case of getting the ball inside the first step is to teach the players to see the position of the post defender. So begin teaching these tactics with only a post defender and initially instruct the defender on where to play. Then you can allow the defender to be live. The next step is to add defenders on the passers. 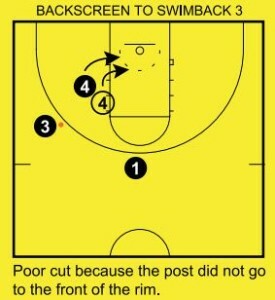 This will now force the passers to use their skills while also reading the post defender. The final step is use the tactic within the context of a 5 on 5 environment, so the passers must recognize the help defenders. With all offensive play, spacing is a critical element. It is important to emphasize spacing throughout the teaching of these tactics to ensure the post player is not crowded when he/she receives the pass. Proper spacing will help prevent the quick double-team on the post and will open passing in and out of the post. The last aspect is timing. The anxious post player will often get into position before the pass is ready to be delivered. The post often ducks-in too early or posts-up before the ball is at the wing; which either results in a 3 second call or allows the defender time to get around the post. It is important for the post player to be patient and allow the play to develop. All teams need to have an inside threat. Whether you simply teach the tactic or concept, or incorporate them as part of a play, these are steadfast methods which wil usually be effective when executed properly. While there are many ways to get the ball inside these are some of the most effective and popular ways. I am looking for a software that will allow me to draw /diagram plays.I like the way that you diagram your plays. Try fastmodelsports.com (outstanding program, paid version) or jes-soft.com (lighter version, free download). Hope this helps.